Avia is a Czech aircraft and automotive company notable for producing biplane fighter aircraft, especially the B-534, and trucks. The company was founded by Miroslav Hajn and Pavel Bene� in 1919 and became part of Škoda in 1928. During the 1930s the factory became the biggest aircraft producer in Czechoslovakia and moved to Letňany. During World War II Avia produced aircraft for the German Luftwaffe. After the war the company was nationalized and became involved in the automotive industry. It manufactured aircraft up to 1963, then continued to make aircraft engines (producing only propellers from 1988) and targeted truck production. The company was split in 1992 into propeller and truck sections, both using the Avia brand. Before the war the company produced civilian and military aircraft, including the Avia BH-21, Avia B-534 and Avia B-71 (Soviet licensed Tupolev SB). Avia had started building Messerschmitt Me 109G soon after WWII as the Avia S-99, but soon ran out of the 109's Daimler-Benz DB 605 engine. The first S-92 was assembled at Letňany Research Institute in 1945 with the airframes coming from Avia and the engines from the repair works in Male�ice (the Junkers Jumo 004, now called the M-04). The S-92's first flight was on 27 September 1946, with Avia's chief pilot Antonin Kraus in control. That same year on December 10 the CS-92 took to the air for the first time. An Avia S-92 (A-1a) and Avia CS-92 (B-1a) can be seen at the Vojensk� Muzeum, Kbely AB. Later produced Avia B-33 (licensed Ilyushin Il-10) or Avia 14 (licensed Ilyushin Il-14), that airliner version (able to carry 42 passengers) became the largest aircraft ever produced in Czechoslovakia. In 1956, Avia made prototypes of a small automobile. It had a single centrally-placed front seat and steering column, two rear seats, a sliding cabin for access, and a rear-mounted 2-cylinder 350cc Jawa motorcycle engine. The layout was shared with the Moravan car, which was built at Otrokovice. First of all, the enterprise concentrated on assembling T-805 vehicles. In 1961, it switched to the manufacture of Praga V3S/ S5T, the medium duty truck. The legendary three-tone off-road V3S was maintained in AVIA's manufacturing program until 1988. The vehicle was manufactured not only as a platform car but with different types of bodies as well. It fully utilised its construction designed for extraordinarily heavy use in the army, on site, in forest as well as in any other operation demanding a high performance under the heaviest conditions. 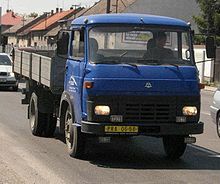 The modifications of the Praga S5T model also included a semitrailer truck, S5T-TN model with a “ trambus” cabin. In 1963, manufacture of chassis units for the OT 64 (SKOT) armoured carrier was launched. Praga and Tatra enterprises, but also some Polish manufacturers participated on the manufacture. In 1965, structural changes of demand concerning a small tonnage lorry appeared both in national and international market. At the AVIA enterprise, they were considering two ways ahead, i.e. own development and/or use of a suitable licence strategy. As a conclusion, the French Renault-Saviem manufacturer’s offer for two types of trucks was accepted. In the autumn of 1968, the first products started to leave the assembly line. The larger vehicle was named Renault-Saviem SG 4 Super Galion (later AVIA A30), and the smaller was named SG 2 Super Goelette (later AVIA A15). The new manufacture as well as its scope required new buildings as well as modernization of existing enterprise’s premises. New big buildings containing advanced equipment were constructed and thus AVIA was included among the largest Czechoslovak car manufacturers. The yearly production reached 17,000 vehicles. During the years, the manufacture of the AVIA vehicles was continuously modernized. The volume of the Diesel engine increased from original 3.32 up to 3.61, and practically all vehicle units were adapted. In 1983, the AVIA A31 developed from the AVIA A30 model, while the AVIA A15 (later A20) furgon was transferred to the AVIA A 21 model. From 1974 to 1978, modernization of A20, 30, and 40 models was prepared, bringing small wheels, redesigned axles, new dashboard, enhanced cab interior, etc. In 1986, the AVIA National Concern comprising also affiliates in Brno, Ivančice and Žilina was incorporated in a so-called “Industry Economical Unit” together with Praga, BSS, Metaz and Kutnx� Hora enterprises. As per 1st July 1988, a new state enterprise, AVIA Concern, comprising Avia, Praga, BSS, and Dačick� strojx�rny concern enterprises was established in accordance with the State Enterprise Act. AVIA Letňany as the parent factory manufactured engines and cabs and assembled all of the chassis. A part of the chassis was fitted with a platform-type superstructure and also vehicles with a furgon-type body were manufactured here. The Brno, Ivančice and Žilina factories purpose superstructures were assembled on the chassis. The Kutnx� Hora factory manufactured all types of axles for AVIA vehicles. The key assortment of Praga Concern Enterprise included truck and bus gear units and a number of other parts for the automotive field. The Dačick� strojx�rny Concern Enterprise produced parts for our car manufacturers. The body assortment was still growing: box bodies, isothermic box bodies, bodies including a cooling unit, assembly platforms, container bodies, dumpers, towing trucks, and other different bodies were manufactured. The AVIA chassis also served as a base for the small buses manufactured in Bulgaria, Yugoslavia and Hungary. In 1989, the concern split in single businesses. In the same year, AVIA Letňany launched assembly of A21 FC furgons by use of pressed parts. In 1993, manufacture of AVIA vehicles equipped with turbo engines designated as A21T and A31T was launched. At the same time, the engine power of these vehicles was increased up to 65 kW, which met the EURO I Standard. Subsequently, an engine with the power increased up to 76 kW (or 85 kW) and intercooler meeting the EURO II Standard was developed. The enhancements also included a modified chassis, strengthened drive unit, power steering system, modified braking system, improved cab interior and enhanced technical parameters of the vehicle. In 1992, AVIA was transformed into a stock company, and also Avia - Hamilton Standard, a new company with AVIA's equity share manufacturing aircraft propeller was established. One year later, the propeller manufacture was moved from the Letňany factory to the new premises near Starx� Boleslav. This definitively terminated the aircraft production in Letňany. 66% of the AVIA Company was privatized by Czech entities in two waves. To ensure the further development of the Company, the Government began to seek for a foreign investor. The relevant discussions were led with several parties concerned. In the first line, it was RENAULT, the French car manufacturing company, with which AVIA already had good long-term experience; followed by the German MERCEDES-BENZ company. However, the 1995 public tender was won by a consortium formed by the South Korean DAEWOO company and Austrian STEYR company. The consortium bought 50.2% of AVIA's shares, thus becoming the majority owner of the Company. The year after, the trade name of the Company was changed to DAEWOO AVIA, a.s. In the same year, the Company became the exclusive importer and distributor of DAEWOO vehicles for the Czech Republic. In 1997, the AVIA A Series was modernized for the last time. AVIA A 60/ 65/ 75/ 80 models entered the market. The vehicles had a completely new chassis fitted with a riveted frame, fixed front axle, front disk brakes, lesser wheels 205/75 - 17,50" and EURO II engines with the power of 76 kW and/or 85 kW. The vehicles were fitted with a five-speed/six-speed gear-box. The cabs had a new interior, advanced design and they were tilt cabs in the first line. Generally, 250,000 AVIA A Series vehicles, which can be seen in high numbers on our roads even today, left the assembly line of the Letňany car factory in the period between launching the production in 1968 up to its termination, which took place on 13th November 2000. From 1997 to 1999, the Letňany car factory was also assembling LUBLIN and LUBLIN II, the light commercial vehicles imported disassembled from the DAEWOO MOTOR POLAND company. Simultaneously, preparation work on a completely new product continued. The DAEWOO AVIA�s new management team staked a demanding goal comprising of development and implementation of a completely new medium duty truck, which would cover the 6 to 9 tonnes weight class and would be fully competitive in the western markets in terms of design. The vehicle cab, which got a completely new design and provided a maximum comfort both to driver and crew, was the most significant component of the vehicle. The English DAEWOO designers took a part in the development of the new cab and its interior, while DAEWOO AVIA specialist designers were responsible for the project co-ordination, and engine/chassis development. The new vehicle known as AVIA D Series had its debut in the Czech market in the end of 2000. The major change that came along with the AVIA D 60/90 Series vehicles was mounting of new driving units meeting the legal requirements of EEC R49-03 without a need to re-circulate the exhaust gases. The units included a self-constructed and self-produced engine titled as AVIA D432.100, and CUMMINS ISBe 150 30 engine (England). The CUMMINS engine, with its more even speed-torque characteristic, has applied its advantage namely in more distant transports. Since 2002, the manufacturer has been offering two German ZF company’s gear-box types with the vehicles. Specifically, it comprises the ZF S5-42 five-speed gear-box or ZF S6-850 six-speed gear-box. However, by the middle of this decade, the operations shrank and volumes dwindled, to reach 650 in 2006, though sales demand remained strong in the home market and in the UK, Spain, Hungary and Ireland - in the latter, Avia had a 16% market share of its segment in 2006. In 2007, a leading commercial vehicle manufacturer from India, Ashok Leyland, took over AVIA. The company has since been renamed Avia Ashok Leyland Motors (AALM). Soon thereafter, Euro 4-compliant models were introduced in the market. And the strengthening of the marketing infrastructure is on, to support the ramp up of volumes at AALM. AALM’s range today spans the gross vehicle weight range from 6 tones to 12 tones. Dependent upon model the gross combination weight with a drawbar trailer can be as high as 22 tones, providing for highly economical operation. 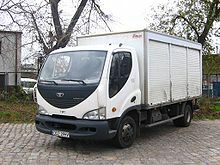 As a truck maker, Czech Avia should not be confused with the Spanish Avia. Avia Pictures and Avia for Sale.